You may have noticed my post a couple of weeks ago showing you what I had got through the post. I received an Original Big Body Bib to put through it's paces. I have been using it on Layla for a couple of weeks, so I'm now going to share my thoughts with you. This company was founded last year, these bibs were originally made for the owners two sons to use but they soon realised this idea was too good not to share with others. I have to admit I love the concept. I don't know about you but Layla is always managing to spit her food down her clothes rather than on her bib, so the idea of this bib intrigued me, could it work?? Here we have my 3, 5 and 7 year olds each modelling the bib, they are all of average size and as you can see it is only just starting to get too short on my 7 year old, so you know the bib will last well. I love the materials they chose to make it out of, cotton one side and fleece the other. 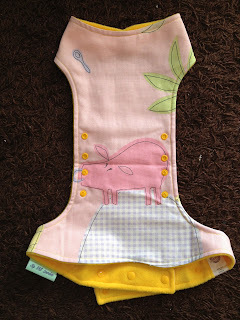 The one I received has a cute pig design on the front and yellow fleece back with yellow poppers. This sort of material means that even when they spill drink down it, your child stays dry because the fleece absorbs it. It also means that when washed it is very quick drying, infact it comes out of the washing machine practically dry already. It has been through the wash several times now and I have had to use stain remover at times, you know the dreaded orange stains!! The stains come out no problem and the bib has kept it's shape and size perfectly. 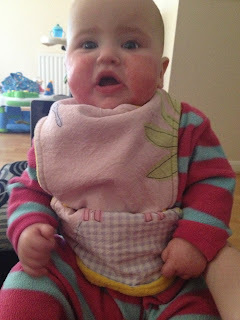 As you can see from the picture above, Layla's body is completely covered, it really does work, I have had a lots less washing since using this bib as it manages to completely cover her tops and where we do a mixture of spoon feeding and blw, believe me there is a lot of food that gets dropped. Overall I couldn't recommend this bib enough, it is a great twist on the idea of a bib. The only negative I could find was that there was only one popper to fasten around the neck, it could have done with a couple more to make it tighter on Layla. I would love to see them made with sleeves as well!!! I think because of the design, it works well for babies right up to older children who maybe struggle to feed themselves. Why not go and check out their website where you can pick from in stock bibs or even customise your own bibs, you can even pick which colour poppers you would like!!! And please go and say hello on their facebook page and let them know what you think.